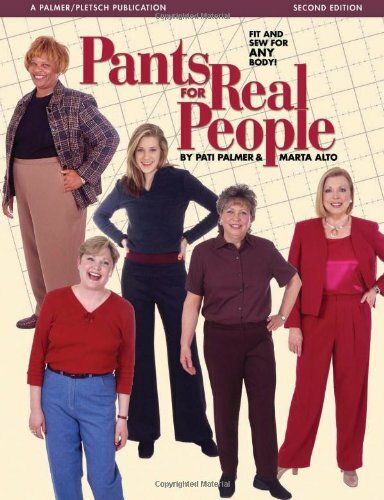 This pattern book features step-by-step instructions on fitting and sewing pants for women of all body types using the twin techniques of tissue fitting and fabric fitting. Important sewing choices are highlighted, including choosing fabrics, selecting appropriate alteration tools, and finding styles that are most flattering. The fit-as-you-sew process of making pants is illustrated with progressive photographs and step-by-step illustrations. A variety of styles are covered, including nonroll, expandable, and contour waistbands; side seam and patched pockets; and easy hems and cuffs. This updated second edition features refinements to the fitting and sewing information and has added instructions on the fitting and sewing of jeans and no-side-seam pants. Marta Alto is the coauthor of Fit for Real People, Jackets for Real People, The Serger Idea Book, and Sewing Ultrasuede. Pati Palmer is the CEO of Palmer/Pletsch Publishing, a designer and consultant for the McCall Pattern Company, and the author of Creative Serging, Mother Pletsch's Painless Sewing, and Sewing Ultrasuede. They both live in Portland, Oregon.